I wanted to share a phone call I received from Joe Liccese (Executive at Bayer Polymers) this morning. He had EXTREMELY high progress for the USWeb team members that attended the meetings at Bayer AG on the recent trip to Germany. The days were filled with long meetings and extremely intense and technical conversations with the results being a “buy-in” to our methodology and development process. The fruits of this labor is the awarding of a major contract to develop a new site for the International Plastics and Polymers division, much more than was originally hoped for. 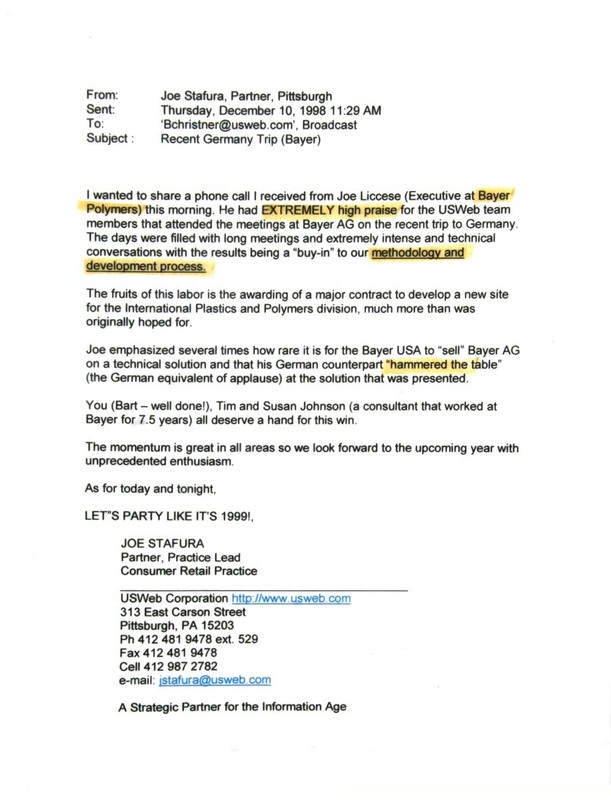 Joe emphasized several times how rare it is for the Bayer USA to “sell” Bayer AG on a technical solution and that his German counterpart “hammered the table” (the German equivalent of applause) at the solution that was presented. You (Bart – well done! ), Tim and Susan Johnson (a consultant that worked at Bayer for 7.5 years) all deserve a hand for this win. The momentum is great in all areas so we look forward to the upcoming year with unprecedented enthusiasm.